As the Beijing correspondent for The New Yorker, Evan Osnos was on the ground in China for years, witness to profound political, economic, and cultural upheaval. In Age of Ambition, he describes the greatest collision taking place in that country: the clash between the rise of the individual and the Communist Party’s struggle to retain control. He asks probing questions: Why does a government with more success lifting people from poverty than any civilization in history choose to put strict restraints on freedom of expression? Why . . . The Thirty-­Six Strategies of Ancient China is an easy to read and fascinating look at how many of the strategies and tactics mentioned by Sun Tzu in his book The Art Of War, were employed in ancient times. It is well known that with a population of 1.­3 billion people, China's market is moving quickly toward surpassing those of North America and Europe combined. Companies from the United States and around the globe are flocking there to buy, sell, manufacture, and create new products. But as former China bureau chief turned successful corporate executive James McGregor explains, business in China is conducted with a lot of subterfuge -- nothing is as it seems and nothing about doing business in China is easy. Destined to become the bible for business people in China, shows how to navigate the often treacherous waters of Chinese deal-­making. Brilliantly written by an author who has lived in China for nearly two decades, the book reveals indispensable, street-­smart strategies, tactics, and lessons for succeeding in the world's fastest growing consumer market. Foreign companies rightly fear that Chinese partners, customers, or suppliers will steal their technology or trade secrets or . . . Soon, China will rule the world. But in doing so, it will not become more Western. Since the first publication of, the landscape of world power has shifted dramatically. 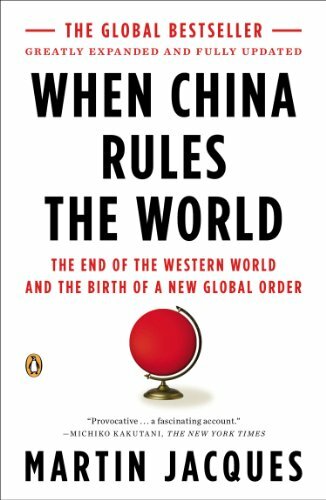 In the three years since the first edition was published, has proved to be a remarkably prescient book, transforming the nature of the debate on China. Now, in this greatly expanded and fully updated edition, boasting nearly 300 pages of new material, and backed up by the latest statistical data, Martin Jacques renews his assault on conventional thinking about China’s ascendancy, showing how its impact will be as much political and cultural as economic, changing the world as we know it. First published in 2009 to widespread critical acclaim - and controversy - has sold a quarter of a million copies, been translated into eleven languages, nominated for two major literary awards, and is the subject of an immensely popular TED talk. In this poignant memoir the bestselling author of, Adeline Yen Mah, provides a fascinating window into the history and cultural soul of China. Combining personal reflections, rich historical insights, and proverbs handed down to her by her grandfather, Yen Mah shares the wealth of Chinese civilization with Western readers. Exploring the history behind the proverbs, she delves into the lives of the first and second emperors and the two rebel warriors who changed the course of Chinese life, adding stories from her own life to beautifully illustrate their relevance and influence today.